A cuddly toy of your panda. A panda factbook with lots of interesting information, plus bookmarks and stickers. An adoption certificate to frame your commitment to the WWF (printed on recycled paper). Two exclusive magazines: WWF’s ‘Wild World’ and ‘My Panda’ with news and updates for your adopted animal. Your kind donation will help provide the funds for WWF to create ‘green corridors’ to link isolated pandas, patrol against poaching, and help to stop the illegal logging of their habitat. Please adopt me today and help to halt the decline in my brothers and sisters across the globe. There are only 1,600 of us left in the wild now due to illegal logging and poaching, and many of us now live in the mountains, separated from one another. By helping WWF you are helping us too and the next generation of panda’s live in the wild. 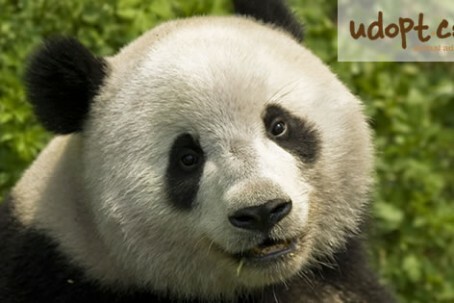 Although it is classified as a carnivore and a bear, the giant panda bear behaves very much like a peaceful herbivore. The panda’s diet consists almost entirely of bamboo although they have been known on occasion to betray their bear ancestry by eating small rodents and birds. Like most large animals, the panda spends most of its time eating enough food to support its massive body. Bamboo is not very nutritious and so the panda must consume a lot in order to get the nourishment it needs. Every day, a panda spends twelve to fifteen hours eating and will eat up to thirty kilograms of bamboo, which is almost half of its body weight. Much like any other species of bear, the giant panda is a solitary animal that maintains a territory by marking it with his scent. The male giant panda’s territory will be shared with several females that are also his mating partners. As pandas roam, they also call out to each other. Scientists have identified eleven unique calls that pandas use to communicate. The panda is the only species of bear that does not hibernate. Other bears are able to store energy form the high calorie meat that they hunt. Pandas, however, need to be eating constantly in order to get the nutrition that they need. Other bears have the luxury of giving birth while hibernating. This allows the cubs to have several weeks to grow before they have to face the world. Things are not so easy for the panda. Pandas give birth in hollow trees or caves and take the new born with them while they forage for food. Black pandas tend to stay by themselves or with their babies. White pandas graze in groups of up to twelve individuals. All pandas have a strong sense of smell and use this to find group members after they are separated. Baby pandas are extremely vulnerable. At birth, they weigh only 100 grams. Blind and hairless, pandas can’t even begin crawling until they are three months old. Mothers must carry the baby on her back until it is six months old. Babies drink only milk until they are a year old. It is not until they are a year and a half old that baby pandas can become independent. Eventually, they move away and establish territories of their own. Panda babies are so dependent that the mothers can only take care of one at a time. Human development into panda habitats is the basic cause of why pandas are threatened. The places that pandas live are being taken over by the lumber industry and land development. Zoos are working with animal conservationists to create animal adoption programs. Many people choose to adopt a panda in the wild as a symbolic way to provide financial support for programs that conserve the panda’s natural habitat. When people sponsor a panda they help to put an end to the encroachment of industry into the panda’s territory. Let me tell you about my species. I am related to polar bears and grizzly bears but I really don’t act like them at all. Those bears spend a lot of time hunting and a little time eating. I spend all my time just eating. I never have to look for food because it’s all around me. I eat bamboo and live in bamboo forests. It’s very convenient. I have the digestive system of a meat eater but I graze on plants all day like a cow. Cows have special stomachs for digesting grasses but I don’t. That means that I have to eat a lot of bamboo just to digest enough for me to survive. And I have to chew it until it’s a paste before I swallow. It takes me a long time to eat and I eat a lot. I sometimes spend fifteen hours eating before I can go to sleep. It takes up to thirty kilograms of bamboo just to feed me for one day. I need a pretty big territory to grow all that bamboo. Baby pandas are really helpless. When they are born they are smaller than a hamster. They are also blind and hairless so they have to be kept warm. The baby can’t even crawl until it is three months old and I have to carry it around on my back for a few months after that. I can only take care of one baby panda at a time so usually I just give birth to one baby. Pandas are big enough that the adults have no natural predators in their environment. Cubs are helpless and may be taken by leopards or birds of prey. I have a large territory. I mark my territory with my scent so that other pandas will know that it’s mine. When my cub is old enough to wander, we will stay in touch by calling out to each other. Sometimes people start to move into the same forests that I live in. Before they do that, they cut down all the bamboo and don’t let it grow back. Then there is nowhere left for bamboo to grow. Sometimes they cut down all the trees for the lumber and destroy the places that I can live. This is why pandas are threatened. Only a few people do things that harm pandas. All over the world there are even more people that are trying to help. They do this when they adopt a panda. Animal adoption is one way to sponsor a panda for protection. Hunting is another reason why pandas are threatened. People used to hunt us for our fur. Not even two thousand pandas are left living in the wild. It’s against the law and we are hunted much less than in the past but it still happens. Most people don’t like this and want to help us. Some people sponsor a panda for protection. Animal adoption is something that zoos do to help us. People help to pay for our protection when they adopt a panda. Panda’s were hunted almost to extinction for their fur decades ago but with continued conservation efforts their numbers are slowly returning. That being said, the amount of natural habitat that they can call their own is still being reduced because of human need and because Panda’s only survive in a very specific type of environment, it is for this reason that they are still at threat more than other animals that could adapt to a new environmental condition. Decades ago, pandas were hunted almost to extinction for their fur. Since then, the panda has been recognized the world over as a symbol for conservation. It is also a symbol for peace for the Chinese people. Great steps have been taken to save the panda and slowly the population is recovering. But with less than two thousand pandas in the wild, and the continuation of habitat loss, the panda species is still in danger. Pandas are adapted to a very specific diet and habitat. This is the main reason why pandas are threatened. Much of the panda’s natural habitat has been taken over by humans, pushing pandas into narrow strips of land on mountains. There is no more suitable land that pandas can move into as their habitat is developed for human use. Land development has fragmented and divided panda territories. The number of mates available to pandas has decreased. This weakens the genetic diversity of all pandas. This can make the entire panda population weaker and more vulnerable to disease. Conservation focuses on maintaining current habitat and working with the Chinese government to protect pandas from illegal poaching. Funds for conservation are raised by animal adoption programs. Zoo patrons can symbolically adopt a panda in the wild or sponsor a panda for habitat protection. The black and white appearance of the Giant Panda has become a well recognised symbol for all endangered species. Most of the remaining Pandas roam the bamboo forests of western and southern China. With only about a thousand Giant Pandas left in western China, their existence continues to be threatened by man’s destruction of their favoured habitats and by poaching. Pandas are becoming increasingly rare in the wild, and struggle to survive in isolated areas or reserves some of which are considered too small to support support population recovery. The Pandas don’t make the situation any easier for themselves. With the digestive system of a carnivore, they have chosen instead to browse the bamboo of their forest habitat, the consequence is that they are forced to spend most of their time feeding. 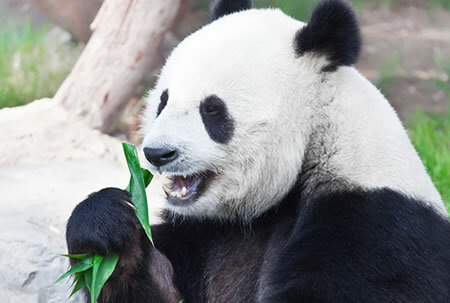 As their main staple diet, adult Pandas must eat an average of 55 pounds of bamboo shoots, stems and leaves daily to get adequate nourishment. All that eating consumes 10 – 16 hours of the Giant Panda’s day. While few can fail to be charmed by the ‘gentle giant’, with it’s fun, innocent and somewhat clumsy appearance, the Giant Panda’s prospects for survival are bleak. By adopting a Giant Panda you are helping to support the work of conservation groups, providing vital funding necessary to carry out their campaigning and efforts to improve and preserve the wildlife and their habitat. 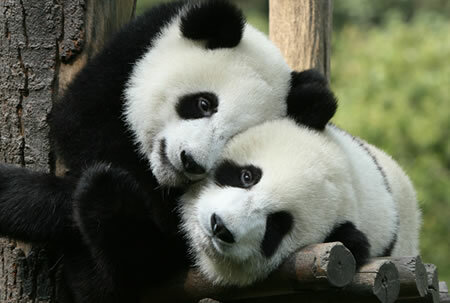 Help to make a difference in the future survival of the animals by adopting a Giant Panda today. 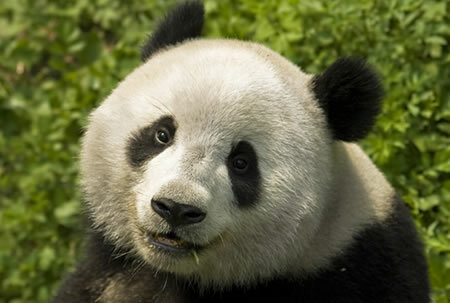 The giant panda bear used to be found in the low lying Yangtze River basin. That area is now heavily populated and developed by humans. 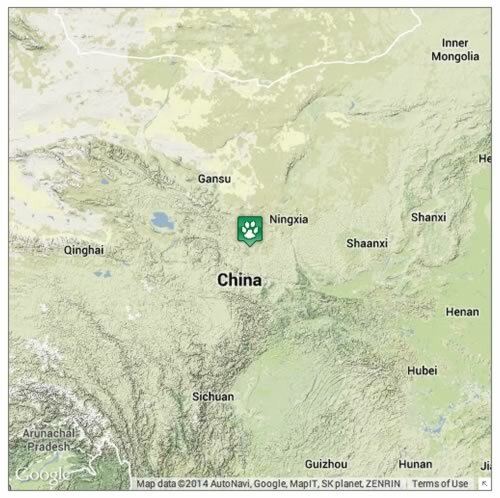 This habitat loss has resulted in panda populations being pushed into the mountainous areas of western and central China as indicated on our map.